3.1 Is vitamin C useful for treating cold? Vitamin C is not produced or stored by the body, so it should be acquired daily through the diet. Vitamin C is necessary for the production of collagen, hormones and neurotransmitters. Poor dietary intake of vitamin C may be responsible for the occurrence of many diseases. Its deficiency can manifest itself in a state of body weakness or other particular symptoms such as bruising, wound healing difficulty or other body abnormalities. The most common way to show vitamin C deficiency is scurvy, a disease characterized by producing a general weakness in the body with anemia and bleeding gums. This disease was very common in sailors who traveled from Europe to America by boat and, since the voyage lasted a long time, had no fresh food to provide them with this vitamin. Scurvy is quite unusual today, specially in rich countries, so we should take into account some other symptoms for vitamin C deficiency. – Eyes diseases: Ingestion of this vitamin helps prevent the onset of eye diseases, especially those of degenerative nature, such as loss of vision, retina detachment, cataracts, macular degeneration or glaucoma. – Diabetes: This vitamin helps sufferers of Type II diabetes to reduce the impact that this disease causes in the body. (Poor vision, infections, healing problems, etc.) A dose of 500 or 1000 mg daily may help minimize these consequences, but it is necessary for a medical consent for the ingestion of these supplements for their potential influence on the levels of blood sugar. – Circulatory system: The intake of this vitamin helps lower blood pressure and prevents the risk of vascular disease. The frequent occurrence of bruising may be due to small capillaries burst. It is unclear whether it reduces cholesterol levels. Some studies show that if can really do it while others suggest it can increase it. – Respiratory tract: For its antihistamine properties it is adequate to prevent allergies and asthma attacks. The intake of about 1000 or 2000 mg daily of this vitamin prevents the body to produce histamines that cause adverse reactions in allergies such as sneezing, mucus or bronchi inflammation that are responsible for asthmatic attacks. It use would also be suitable for other inflammations of the respiratory tract such as sinusitis. Vitamin C t can serve to minimize the use of other commonly used antihistamines that often present some contraindications, such as drowsiness or dry mouth. – Ear diseases: A very suitable antioxidant to prevent the action of free radicals that can facilitate hearing sclerosis and precipitate the onset of hearing loss or vertigo . Besides vitamin C is a blood fluidifier, allowing greater blood flow to the affected area. – Skin diseases: It also helps prevent or improve skin conditions such as psoriasis, eczema, skin spots, burns, skin sagging, wrinkles, etc. – Vitamin C collagen: Vitamin C helps collagen formation which is ideal for the healing of wounds caused by trauma, cuts, burns, surgery. It is also be adequate for the formation of new tissues in problems of broken bones, strains, torn ligaments, arthritis, nose bleeding, etc. – Depression: It participates in the formation of neurotransmitters, making it suitable for most cases of depression, including autumn – winter depression. – Bleeding gums: Vitamin C deficiency can lead to gingivitis. – Menopause: This vitamin, along with bioflavonoids helps to produce more estrogen, reduces hot flashes, irritability and excessive bleeding that occurs at menopause. The usual intake is about 1500 mg daily of vitamin C and about 750 mg of bioflavonoids, divided into two doses. – Alcoholism: vitamin supplements are suitable for treating vitamin deficits in alcoholism. – Constipation: Vitamin C has laxative properties. It has been found that daily intake of 3000 mg, divided into three doses help promote evacuation of feces solving the problem of constipation. – Chronic fatigue syndrome symptoms: Its antioxidant properties may be useful to restore the vitality of the antibodies, weakened by free radicals, especially if combined with other supplements that also help improve immunity, such as astragalus or echinacea. The usual dose would be about 6000 mg per day of vitamin C, in three divided doses, with 600 mg of echinacea for 15 days or the same amount of vitamin C with 400 mg Astragalus during the same time. Go alternating treatments. –Diverticulitis: With anti-inflammatory and restorative properties, it reduces inflammation and helps restore wounds. The usual dose is around 2000 mg daily and 2000 mg of bioflavonoids. – Vitamin C helps iron absorption. Taking daily supplements of vitamin C in foods may be appropriate for patients with anemia since it helps them improve iron levels. – Fibromyalgia: Because of its antioxidant properties. vitamin C helps preserve muscle cells against degeneration which can improve or prevent muscle symptoms of fibromyalgia. The usual dose is about 3000 mg per day in 3 divided doses. Is vitamin C useful for treating cold? Recent studies have shown that ingestion of this vitamin does not prevent the occurrence of diseases of winter cold, such as flu, cold, bronchitis. However, it helps to improve their symptoms and reduce their duration. Daily doses between 1000 and 6000 mg help reduce their duration by 20%. Moreover, symptoms as muscle pain or sneezing are more bearable. 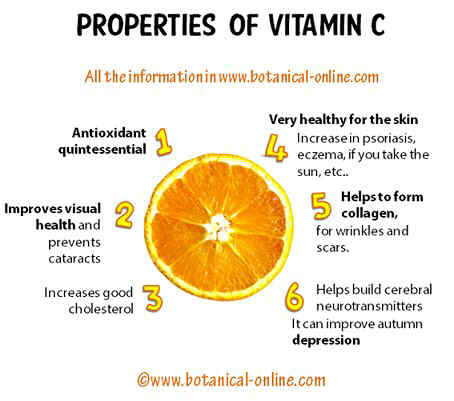 More information about vitamin C.